Vision: Everyone feels responsible for social justice & is active in promoting & ensuring it. 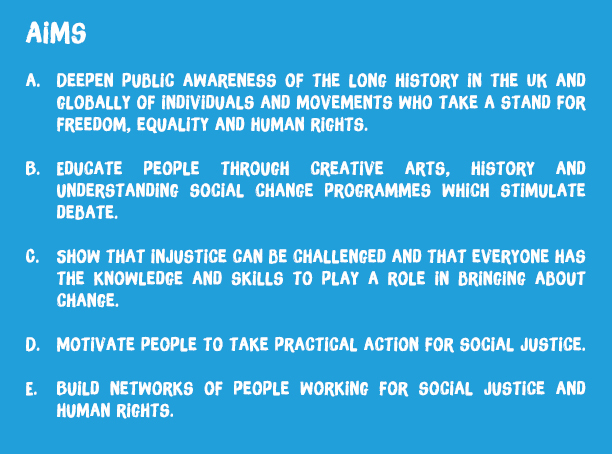 Mission: to galvanise people to take action for social justice through learning about human rights movements and the arts. Dr. King’s belief that our lives are inextricably interrelated and his call for solidarity is a message that transcends time, place and issue and the US civil rights movement remains a universal symbol for people fighting for social justice on every continent. Our first project is a touring exhibition focused on the US civil rights movement and its music which tells the stories of some of the less well-known women, men and children involved. We also highlight some of the many struggles for freedom in the UK. The exhibition and related activities examine key events, themes and tactics, demonstrating what leads people to become and stay active in campaigns. We illustrate how the civil rights movement was influenced in part by the history of dissent in the UK and the US movement affected people, organisations, government and culture in the UK and worldwide. It also helped inspire subsequent women’s, peace and gay liberation movements. As the exhibition travels, we link with local communities, incorporating lessons from UK campaigns for human rights. Using arts and intergenerational activities, we show how change for social justice can happen led by ‘people like us’. Below is an interview with Carrie Supple on the eve of the Footsteps to Freedom in the North East exhibition. With thanks to Peter Woods from Good Cause TV. Read all about our work in ‘Teaching Citizenship‘ (Issue 43), the journal of the Association for Citizenship Teaching (ACT). “What a truly fabulous report. Informative, uplifting, captivating, impressive and inspiring. Your team and volunteers are doing such wonderful things in helping the next generation to be more knowledgeable and respectful of the history of struggle and their responsibility in taking over the baton for justice in future. “Congratulations and appreciation to you all for a fantastic report. It is so comprehensive and full of creativity and inspirational features in line with the values and culture that is the core of the JtoJ DNA. We are a group of educators, youth, community, human rights and faith organisations, artists, film makers, lawyers, musicians, historians, curators and trade unionists. Our patrons are Leyla Hussein, co-founder of Daughters of Eve and campaigner against gender based violence; Baroness Helena Kennedy QC and Sir Geoffrey Bindman QC, outstanding human rights lawyers; Lord Herman Ouseley, founder of Kick It Out – an anti-discrimination football project and Dr. Paul Stephenson, OBE, community worker, civil rights activist and leader of the successful 1963 Bristol Bus Boycott against the colour bar. Please see our management committee members and advisers. Volunteer Stories – polaroids and paper clips and with many thanks to our volunteer Claire McLoughlin who researched and collated the stories. Read a Q and A in the Museums Association online journal about our work here. Why the US civil rights movement? US civil rights history offers us a dramatic example of how powerful leadership and a non-violent cross racial alliance emerged to challenge vicious repression. Interest in Martin Luther King and the story of the movement is strong in the UK as evidenced during last summer’s commemoration of the 1963 March on Washington for Jobs and Freedom. The relevance of the movement goes well beyond its American-ness, nor is it solely connected to racism, but also extends to its universal aspects – concern for economic justice, poverty, war and materialism. In the same way as the story of Gandhi and Mandela resonate in the UK – and the struggles they led will be included in our project, we will focus on key themes to be found in all human rights movements – courage, solidarity, oratory and tactics including the use of music and song. Paul Stephenson was motivated by the Montgomery Bus Boycott and Dr King’s imprisonment. Many individuals, UK institutions and government policies were profoundly influenced by the US civil rights movement and its music became part of our culture. Exhibitions bring people together and make an impact in a visceral and lasting way and enable face-to-face discussion. They can facilitate active partnerships within communities and provide space for people to reflect and inspire each other and respond via discussion, music, poetry, art, photographs or storytelling. We will be able to maximize attendance via our networks throughout the UK. Symbolically, the mobility of the exhibition is appropriate to the way the civil rights movement was present throughout the USA. A travelling exhibition will enable more people to visit than if it was static. We plan to transport it in a replica of the Rosa Parks bus. Why in the UK now? The history of the UK combines examples both of the denial of rights and proud struggles for freedom, equality and the rule of law. The UK has been a place of refuge for centuries and African, Asian, American, American and other activists saw the UK as a secure and sympathetic place from which to campaign and gather support. This part of our heritage is not well known and we want to elevate it. 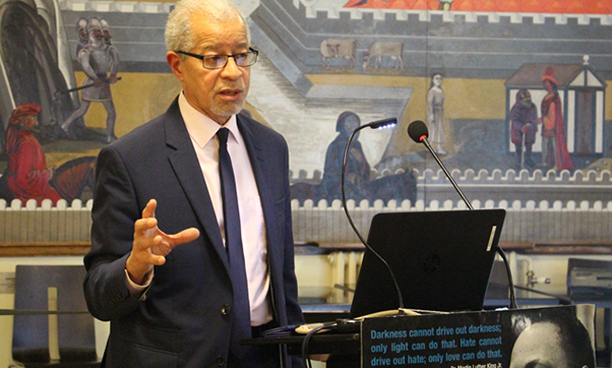 Telling the story of the US and UK civil rights movements including the music, literature, poetry and films they generated will enable visitors, especially young people, to understand the legacy we have inherited and the hard work and sacrifice involved. At a time of growing poverty, inequalities of wealth, education and employment and global insecurity, many feel a sense of helplessness and alienation. There is growing public concern about the decline in participation, trust and engagement and the riots of 2011 and almost one million unemployed young people are evidence of the urgent need for new solutions. Many young people, especially white working class, black and Muslim youth feel disenfranchised by a system which they believe is denying them opportunities. Individualism rules and people have forgotten the history of movements for change which, when taught in an engaging way, can help inspire us to think about non-violent collective means to create a more just society. The response to JtoJ has been tremendous, striking a chord with many who are concerned about injustice now. We will pilot the programme in Newcastle and Sheffield in 2015 and launch in 2016. Key people in education, museums and the arts in Bristol, Liverpool, Belfast, Manchester, Glasgow, Birmingham, Norwich, Cardiff, Newport and London have expressed serious interest in bringing Journey to Justice to their cities.